Many of you have this eBook already, but for those who don’t – you can get it free. 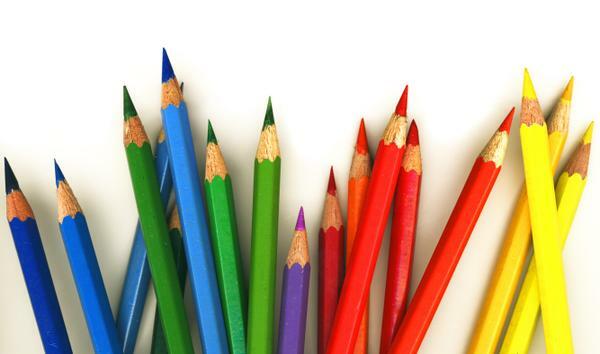 It contains 101 fun pre-school project ideas – and many of them are great for summertime fun! These ideas all came from you, my readers. We put it together several years ago and it’s a fun one! 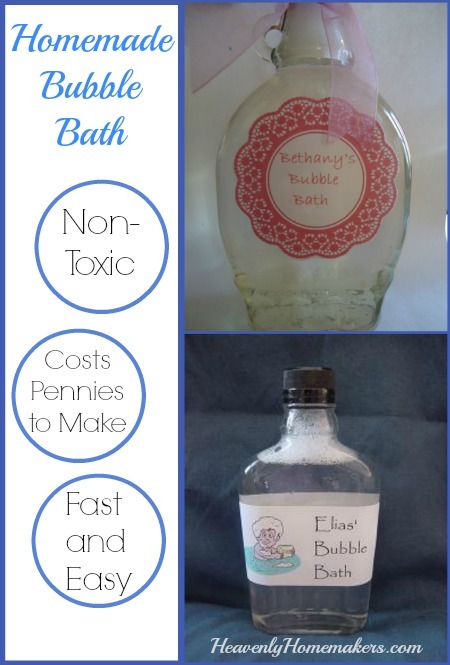 Since this book is FREE, and many of the activities listed inside are inexpensive to do, this definitely qualifies for our “less than $1.00” theme! 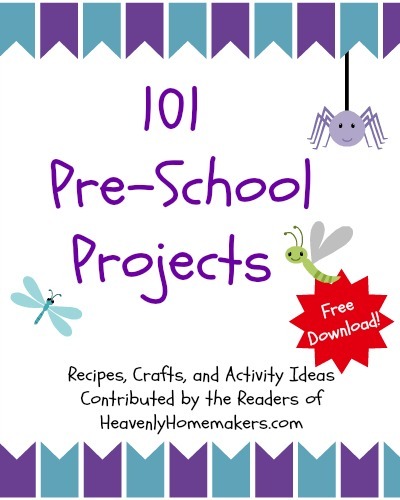 Grab this FREE 101 Pre-School Projects book when you sign up to be a part of our Heavenly Homemaker’s Learning Zone! Summer can be a great time to teach your kids more cooking skills. Here are a couple of Malachi’s favorite recipes: Homemade Real Food Tootsie Rolls and Easy Crustless Pizza Pie. You can also sign up for a free video series (open through June 6 only) that teaches your kids some basic skills, including how to use knives safely. 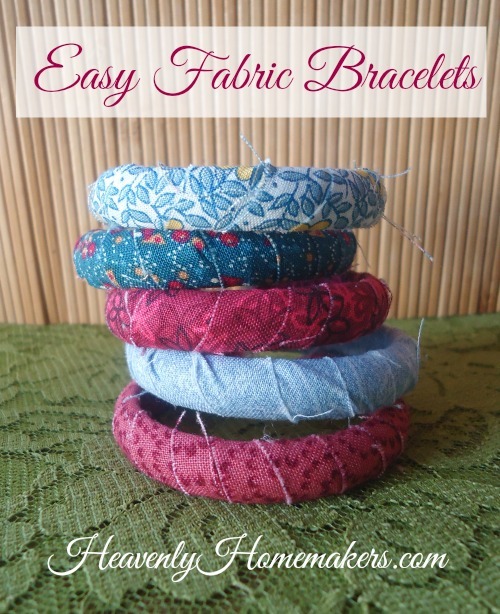 These Easy Fabric Bracelets are really fun to make (even I can do it!). They cost about 8¢ each. If you have girls in your life, making these bracelets might be fun to craft some hot afternoon. 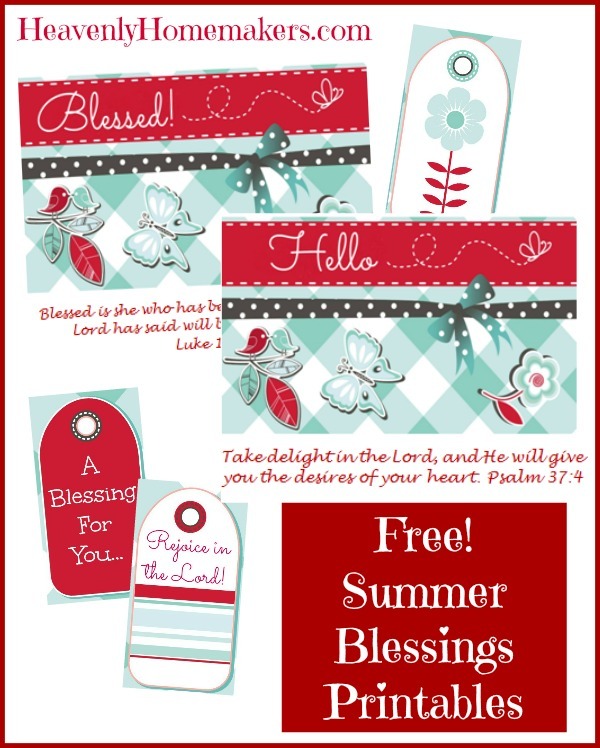 You can grab the download for these printable cards here, then print them off to use this summer as you need them. See our other “less than $1.00” ideas that have been shared this week here, here, and here. 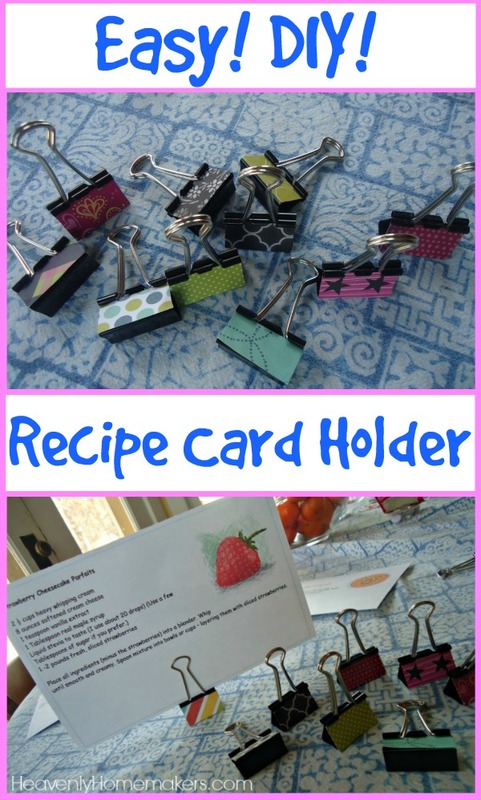 Oh my goodness, I could make these recipe card holder clips all day long. Seriously, a glue stick. Everyone leave the hot glue gun and the whateveryouneedfordecoupage in the cupboard. We’re gluing scraps of paper onto paper clips with a glue stick. Dude, if we have to we can even use safety scissors. That’s how basic this craft is. 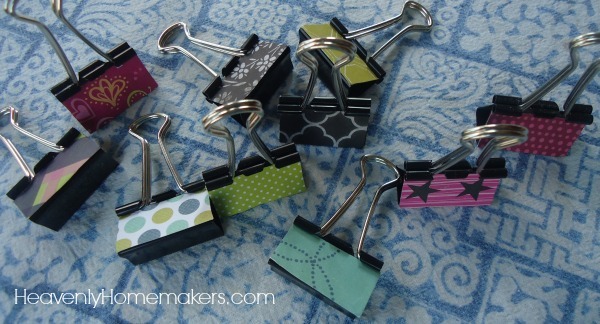 Cut scraps of paper (cardstock, scrapbook paper, construction paper, or paper you’ve decorated yourself) into pieces that fit the binder clips you are using. We made our card holders from 1 1/4″ by 5/8″ clips, so that’s the size I cut my paper scraps. See? This is a no-brainer. Use a glue stick to attach the paper to the clip. There is no fourth step. Your thirty second craft is complete. Make more than one though because once you start you probably won’t be able to stop. These card holders might be fun to give to grandparents with your child’s picture tucked into the clip. Or have your child draw a picture to put in the clip for his/her teacher. 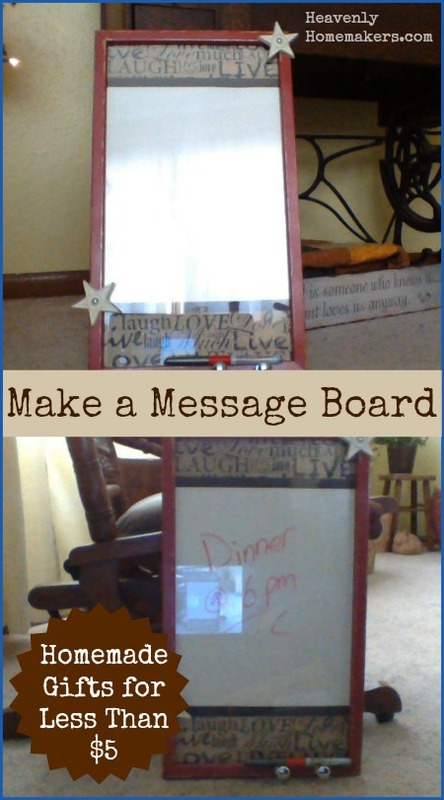 And what a fun way to display scripture cards around your house! 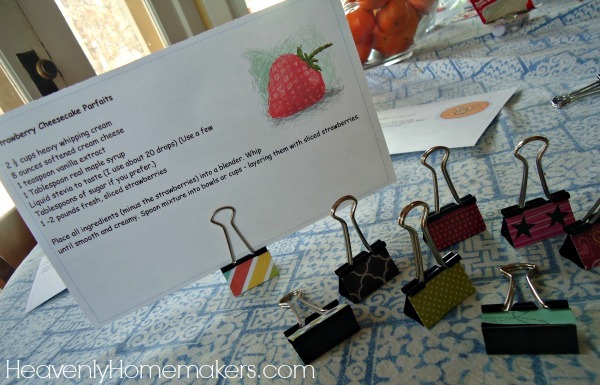 What I love most about using these clips to hold recipes is that for young cooks – having the recipe stand up makes for easier viewing than if the recipe is lying flat on the counter-top. And not that we ever spill anything while we’re cooking, but just in case that would ever happen, this is a great way to keep the recipes from getting slopped on. 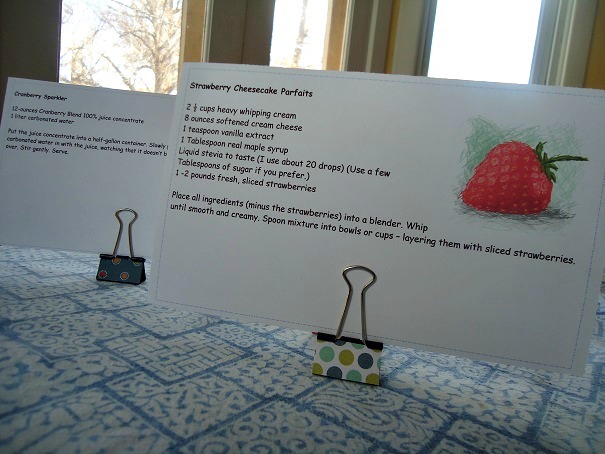 We printed Malachi’s Favorite Cookbook and cut each recipe into easy-to-read cards. Now when he makes his favorites, he chooses a clip and slides in the recipe. It’s a fantastic system! 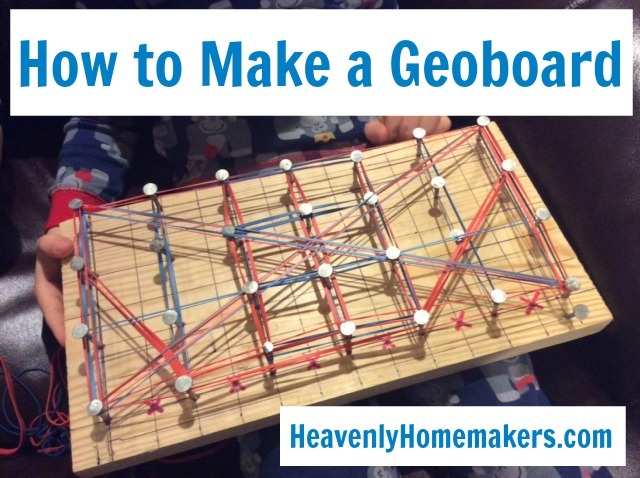 Have fun making these on your own or with your kids! If you aren’t motivated to get your kids into the kitchen by now…well, I will keep working on ya. ;) Teaching our kids to cook is just like anything else: sometimes it seems easier to do the work ourselves instead of working a little harder for a moment to teach our kids to do the job. But trust me when I say that it is worth the effort it takes to equip our kids with cooking skills! Make the decision, and get those kids into the kitchen with you! It will change your life and theirs! You can use Katie’s Kids Cook Real Food eCourse as a springboard. Malachi has been more eager to learn about cooking through these videos than he ever was when I merely encouraged him to put together recipes or crack eggs beside me. For me, he’s been, “Eew, I hate cracking eggs.” But then he watches a cooking video and he’s like, “Yeah. I’ve got this.” And he DOES. Coming up tomorrow: Kid Friendly Pizza Pie Recipe. 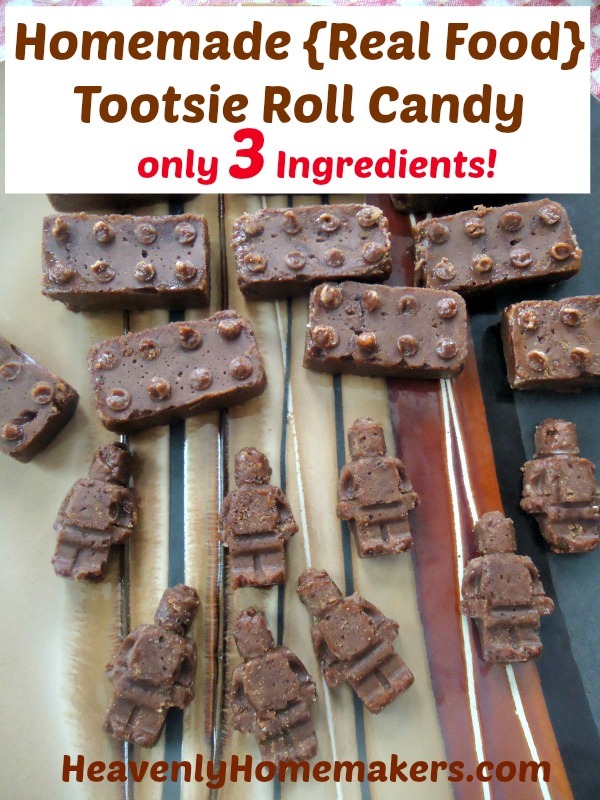 Have you and your kids tried making the Tootsie Rolls yet? Here’s a fun idea Karen sent in. 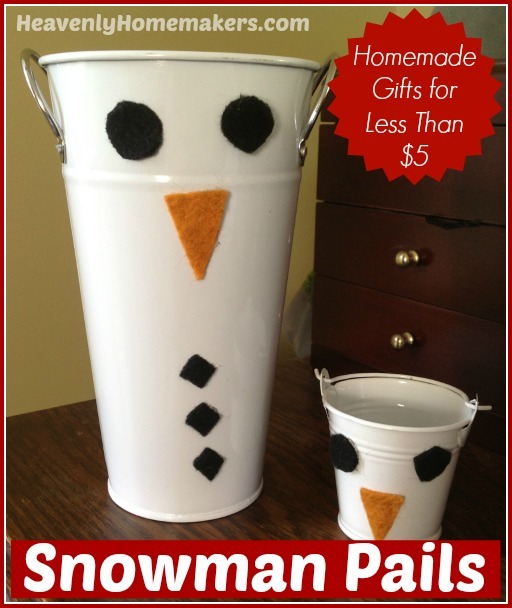 All it takes is someone with a vision – then a simple pail becomes a snowman. Love it! While I am not particularly crafty, one of my daughters is very gifted. She took one look at these metal buckets and saw snowmen! The little ones come three in a package in the party supply section of our local Dollar Store (3 for $1). The bigger one was on a clearance rack at Joann Fabrics for $2. We simply cut shapes from some felt scraps we already had and used the hot glue gun to attach. We thought about adding more decorations but decided on the simple look. Just fill with treats, nuts, or granola for gifting. With the huge success of Frozen and the snowman character Olaf, these have been a big hit with kids! This ends our Homemade Gifts for Less Than $5 series. I have had so much fun creating gifts and learning from you. THANK YOU all for making this series so successful and enjoyable. Now be watching for what’s coming up next here at Heavenly Homemakers – a special healthy living invitation and our annual Holiday Brunch. I can’t wait to share these delicious recipes with you! Where was this idea when my boys were babies? Lacie sent in these instructions and pictures. What a fun gift! Drink the water. Then remove the labels and wash. Decide what you want your bottle to be. Obviously for $5 you can’t do a whole color set, but you could do 3 or 4. I used only items I had on hand for the color ones. Some Items I used: Marker lids, pompoms, q-tips, crayons, colored pencils, buttons, pennies, scraps of paper or fabric, yarn, or ribbon, legos, small plastic animals, straws, plastic utensils, foam shapes, shoe strings, chalk, marbles, anything! For the Christmas ones I did purchase things to put inside. The red and green rice one is easily made by mixing a capful of rubbing alcohol with a small amount of food coloring and putting it on rice. Mix together (wear rubber gloves or you will have colored hands). Lay out on paper towels in a thin layer stirring occasionally until it dries out. 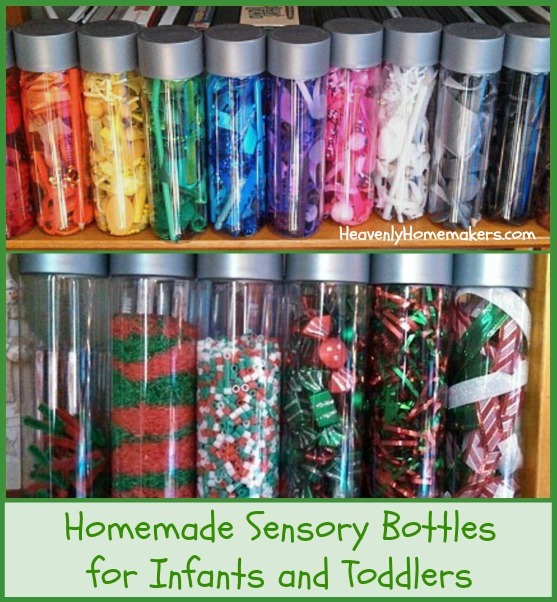 Then put it in the sensory bottle. The colored tinsel can be purchased at a dollar store. You could do an eye spy one for any age, even older child by putting rice in the bottle with various small items (many of the ones listed above would work) and include a “To Find” List naming all the items you have included). The recipient can turn the bottle to move the rice around and find all the included objects. You could do different sounds by placing small items that would make different sounds in each one (buttons in one, jingle bells in one, rocks in one, etc.). The lids CAN be hot glued on to prevent spillage and a choking hazard. I have found that if I tighten them as tight as I can, I can barely get the lids off myself and have yet to see a little one even try to take them off. This is not an original idea. My inspiration came from pinterest. Thank you, Lacie! 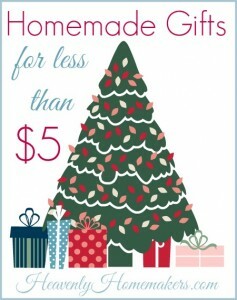 Everyone be sure to check out all the other Homemade Gifts for Less Than $5 Ideas shared so far. I hope you are all enjoying this series as much as I am. So many wonderful ideas! Don’t miss this gem! This recipe stirs together in just a few seconds and costs only pennies. Get the recipe and instructions here. I found the free printables for these candy bar wrappers here. 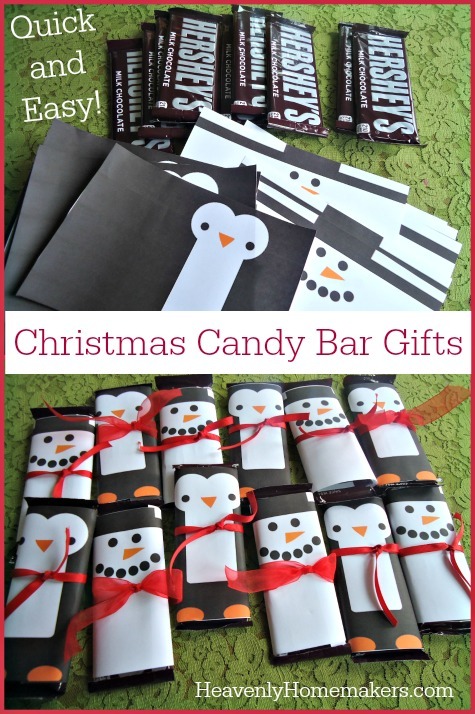 You’ll find other wrappers there beyond snowmen and penguins – those two were just my favorites. :) We’re giving these bars as small “thank you” gifts for youth workers at church. What’s more exciting than receiving a sock full of dry rice for Christmas? Getting a jar full of oatmeal, of course. I wish you could have seen my 12 year old’s face when I told him we were going to make Instant Oatmeal as gifts for our church ministry staff. After all, in a land full of chocolate, candy canes, and marshmallow snowmen – why in the world would we want to give someone instant oatmeal? I reminded my son that our minister has had heart surgery and would likely not appreciate a gift of sugar covered corn syrup. I told him that our office administrator loves to eat healthy food, and that the others on staff would surely appreciate a convenient, warm breakfast. I also reminded him how delicious this Instant Oatmeal is and assured him that it would look adorable in the jars I’d gotten on clearance after Christmas last year. I lost him after the word adorable. Ahhhh, boys. It’s okay though. He still helped me, and even if he doesn’t get why oatmeal in a jar is a great gift idea, I hold to the belief that our office staff will be thrilled. It comes in a jar, after all. What’s not to love? If you haven’t made this Instant Oatmeal for your own family yet, I highly recommend that you get right on it. You’ll especially find it helpful this holiday season as you may be just a little bit busy with extra jobs like stuffing rice into socks, pounding nails into boards, and frosting homemade mint oreo cookies. Not only is this a very convenient and quick breakfast, it’ll warm you right up. 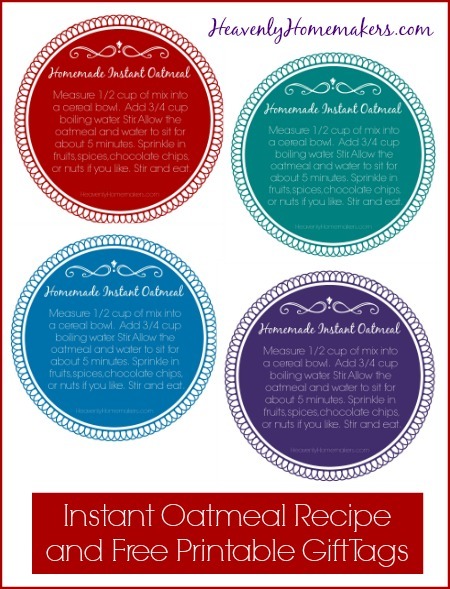 Find our Instant Oatmeal Recipe here. 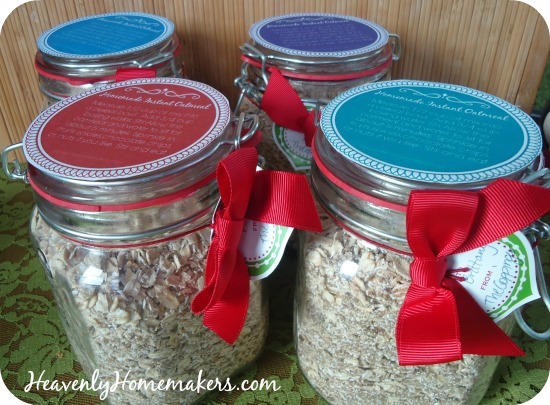 Skip the individual bags and instead fill up gift jars with Instant Oatmeal Mix. 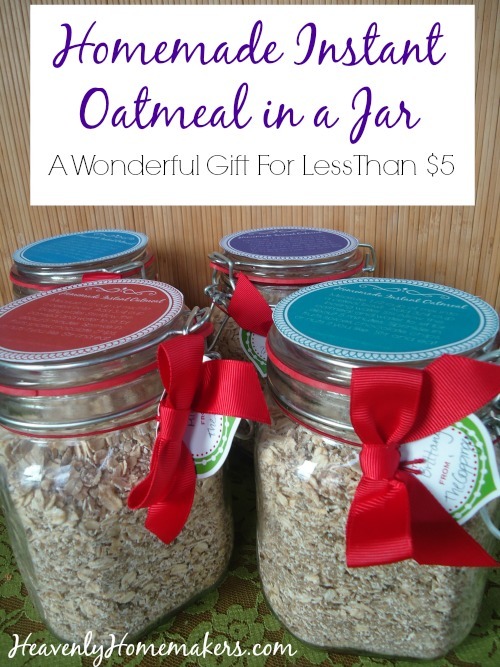 Download and print these fun gift tags, then attach them to the jar so your recipient will know how to make their oatmeal. I may be in the running for the “Most Practical Gift Giver Award.” Who’s with me? Here’s another great idea sent in by Vickie. Be sure to check out her beautiful Pinecone Décor craft, too! This was made using an old picture frame and cost me about $3. Carefully remove the glass from the frame and set aside. If you want to paint the frame, scrub it clean and sand lightly. Apply paint and let dry. If desired, scuff it with fine sandpaper and then seal with clear spray paint. Cut craft paper to fit frames backing, making any desired pattern. Make sure to use one large piece of white or cream paper in the center. Adhere paper to frame back using glue stick or double sided tape. Reassemble the frame with it’s back. Optional, decorate with fun findings. Attach knobs with crazy glue or hot glue and let dry. The marker will rest on the knobs. The glass must be in good condition without scratches or chips. Good smooth glass will allow you to use this as a message board, erasing and re-writing for years. Bonus – if you decided to change your look, all you have to do is open up the frame and change the paper that is inside. You’re putting rice in socks for our coaches. Why would you do that? I have no idea why none of this made sense to my boys. It is so self-explanatory. 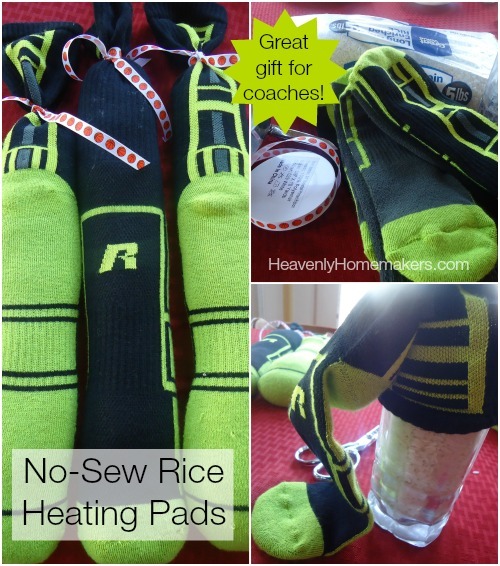 If you, like my boys, have never heard of this lovely Rice Heating Pad idea, allow me to share one of the easiest gift projects on the planet. There are many ideas for these out there, many of which include fabric, a sewing machine, and a pattern. This one though? It only involves socks. The clean kind. New is preferred. Tie a ribbon (grosgrain works best) securely at the top. If you want to be very sure the sock won’t open and spill, feel free to use a needle and thread to close the sock with a few stitches before tying the ribbon. We could just call that version “Barely-Sew” Rice Heating Pads. Because I used large men’s socks, 5 pounds of rice only filled three heating pads. I have no idea what I will do with the odd sock. Maybe I’ll just add it to my laundry and let my dryer eat it. Or perhaps I should buy more rice and make more cool gifts. If you have/use a microwave, you can heat this up for 1 1/2-2 minutes, then put it around your neck to keep warm or use it to relieve pain from sore muscles. Don’t want to use a microwave? Place your heating pad in a baking dish in a 300° oven for 10-15 minutes. 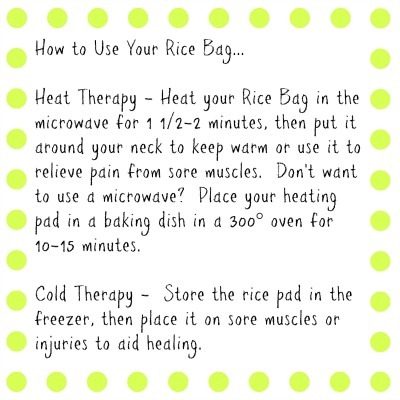 If you prefer ice to heat, store the rice pad in the freezer for cold therapy. Then you can call this your Rice Heating Cold Pad, which makes no sense but is fun to say. Since I’m making these for our boys’ basketball coaches, I bought socks in our team colors and basketball ribbon. Here’s football, soccer, more soccer, volleyball, softball, and baseball. You could also look for ribbon with your recipient’s favorite sport’s team. 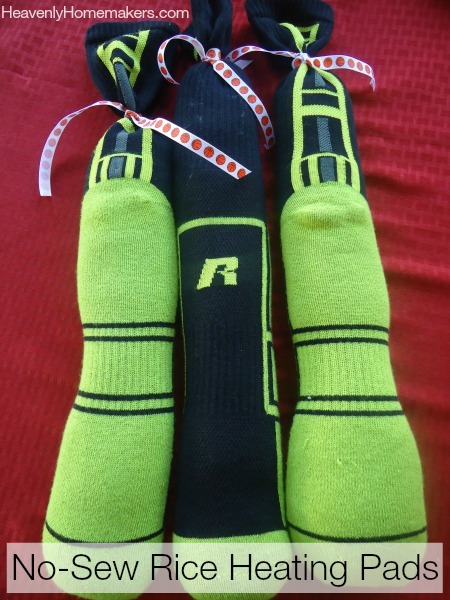 Or, skip the sport idea altogether and pick fun socks and ribbon that fits any person on your list. From Hello Kitty to Duck Dynasty, I’m pretty sure you could tailor make these heating/cooling pads for just about anyone. I figured this gift costs just a little over $2 each. Not too shabby! Ever used a Rice Heating/Cooling Pad? Cantina sent in this idea, along with instructions and pictures. This is a great homemade gift for kids! Our middle child loves to build and he is great with a hammer. 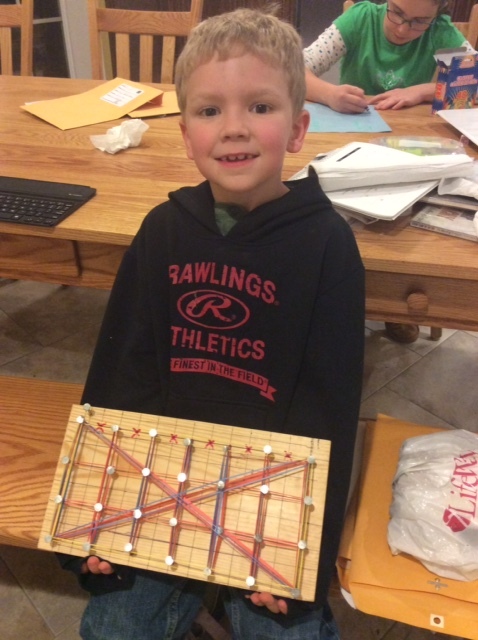 With a little help he is making geo-boards this year. We had a scrap piece of lumber that he spray painted (picture above is the first one we did and it wasn’t painted). Then we use graph paper to hammer in nails in 2 inch squares. Don’t nail them all the way down. Then with colored rubber bands you can make all kind of fun shapes. My children have had the best time with this board and Elijah is now making a few for Christmas presents. The nails cost $1.97 per pack and the rubber bands were $.97 a pack. Since we had the scrap lumber and spray paint these will cost us under $5 per board. Thank you, Cantina! I think I will put my 12 year old on this project. What a fun idea!